OVER 2 MILLION SERVED! During the weekend of November 4, 2006, Kentucky Hunters for the Hungry received and processed enough deer to put it beyond the 2 million meal mark for the Commonwealth's needy. is a non-profit, charitable, volunteer-run organization comprised of responsible hunters and conservationists who encourage hunters to harvest and donate an additional deer each season. Donations are processed by KHFH and meat is distributed by The Harvest www.kyharvest.com to homeless shelters and food banks throughout Kentucky. In 2006, all hunters who donate a deer to an authorized KHFH processor will not be require to pay any processing fees as KHFH will cover all costs. Donate an "extra" deer to Kentucky's hungry and help further wildlife conservation for the benefit of all of Kentucky. Here's how it works: After you have filled your own freezer with venison for the season, pick up an extra doe tag (Zone 1) or use one of your regular deer tags for a "doe-nation". Statistics indicate that Kentucky ranks high for its number of hungry children. The average age of a hungry person in Kentucky is eight years old. Protein is a proven ingredient in brain development and early learning potential. Kentucky's hungry kids need your help. So, become a Kentucky Hunter for the Hungry and friend of Kentucky Wildlife conservation. 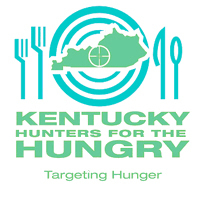 The Department of Fish and Wildlife Resources is very supportive of the efforts of the Kentucky Hunters for the Hungry. This allows Kentucky sportsman and women and children to play a major role in deer management while providing thousands of nutritious meals to hungry people across the state. Dowdy's is one of the locations to donate or help out to provide service to the wounderful program.